Way back in the 80's when my grandmother passed away I inherited her engagement and wedding bands as well as her mother's wedding band. 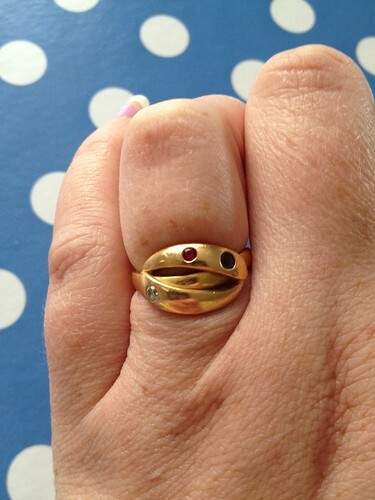 The oldest ring was very thin and worn and we took all three rings to a gold smith to have them altered into one ring. After a couple of years I decided to just get used to it and start wearing it after all. We also built on it and added an amethyst to it (my birthstone) and later a diamond as well. After Isabel was born I added a ruby which is her birthstone. For the past few years though it has been too small and I ended up putting it in a bowl in the kitchen window and there it's been until this weekend. I took the ring, a ring and pearl pendant, a gold chain and a little heart pendant I got for my christening to a gold smith in town and we had a nice discussion and design session where he drew up a sketch for one ring using all my gold. I had plans to make two equal valued rings that I could wear now and that I could pass on to my girls, but we talked about that and came to the conclusion that it's better to make one thing of it that I really like and will wear and when the time comes to pass it on we'll melt it down and make two things for the girls that they really like then. I called him this morning and asked him to get started on it after talking money with Rickard. I also left my own wedding and engagement rings with him to have them altered so I can wear them again. I go to pick them up in two weeks and he will have the ring prepared so I can try the new one on then. So excited!